Background: The number of severely obese requiring laparoscopic procedures has increased in the U.S. Laparoscopy is the standard approach for basic gastrointestinal procedures such appendectomy and cholecystectomy. 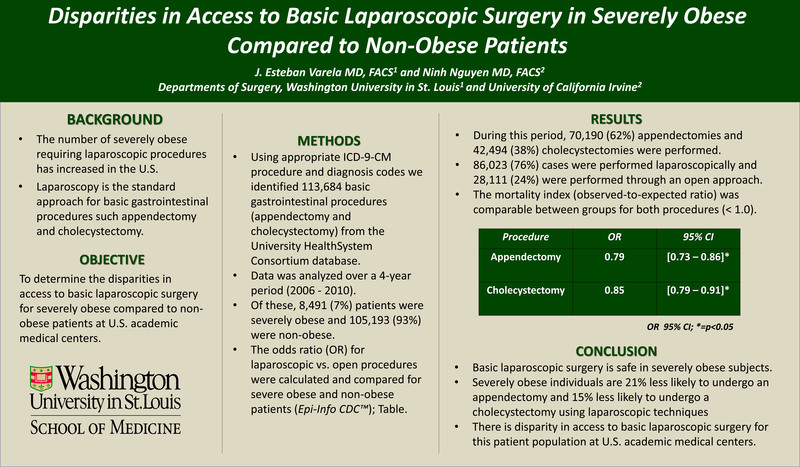 We determined the disparities in access to basic laparoscopic surgery for severely obese compared to non-obese patients at academic medical centers. Methods: Using appropriate ICD-9-CM procedure and diagnosis codes we identified 113,684 basic gastrointestinal procedures from the University HealthSystem Consortium database over a 4-year period (2006 – 2010). Of these, 8,491 (7%) patients were severely obese and 105,193 (93%) were non-obese. The mortality index (observed-to-expected ratio) was calculated. The odds ratio (OR) for laparoscopic vs. open procedures were compared for severe obese and non-obese patients (CDC, Epi Info™). Results: During this period, 70,190 (62%) appendectomies and 42,494 (38%) cholecystectomies were performed. 86,023 (76%) cases were performed laparoscopically and 28,111 (24%) were performed through an open approach. The mortality index was comparable between groups for both procedures (< 1.0). Compared to non-obese patients, univariate analysis demonstrated that severely obese individuals were 21% less likely to undergo an appendectomy using a laparoscopic approach (OR=0.79 [95% CI: 0.73 – 0.86]; p<.001) and 15% less likely to undergo a cholecystectomy using laparoscopic techniques (OR=0.85 [95% CI: 0.79 – 0.91]; p<.001). Conclusion: Basic laparoscopic surgery is safe in severely obese however there is significant disparity in access to basic laparoscopic surgery for this patient population at U.S. academic medical centers.